Your bartender tonight is Tim Quinlan. 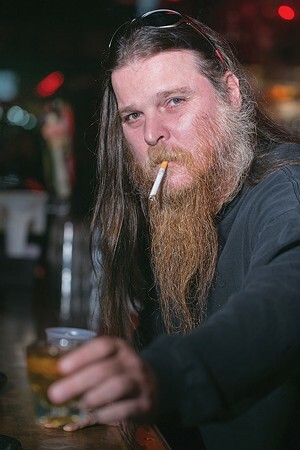 If you've been to Gooski's in the last 17 years — whether for a post-work beer, a weekend Bloody Mary or to see a band — you've probably been waited on by Tim Quinlan. For many patrons, in fact, Quinlan practically is Gooski's. Built like a pro wrestler and fond of greeting customers as "brother" or "lady," Quinlan is a man of few words. 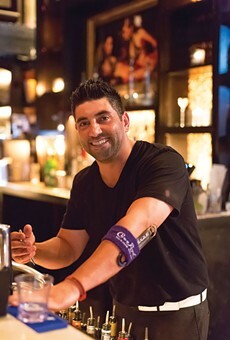 When asked if he knows why people voted him the city's best bartender, for example, he laughs and says, "No." Then he observes that since Gooski's owner Marcus Visco keeps prices low, "The drinks sell themselves." Quinlan's fans are less reserved. On overhearing him being interviewed recently, a small group at the bar began calling out a chorus of "Tim is the best!" and "We love Tim!" Quinlan just smiled, shook his head and stepped away to wait on someone else. But what is it about Quinlan that inspires seemingly universal affection? "Tim has the uncanny ability to remember people's faces and what they drink," says bouncer and cook Matt Hanzes. By Quinlan's own estimation, the mark of any good bartender is speed ("Don't make people wait for a drink," is his philosophy) and a good memory is key to keeping up the pace. If you remember a regular's drink, Quinlan explains, you can get it ready while listening to someone else's order. He makes it sound easy; in reality this method requires a serious talent for multitasking. "On nights where we get really busy," Hanzes says, "[Quinlan] can handle the entire bar by himself, where other bars would need two or three bartenders." Plus, at around 6'5", Quinlan's presence alone seems to keep things from getting too wild on a busy night. "I'm not necessarily the biggest guy," Hanzes says. But during his first few days of working the door, he recalls, "Tim said, ‘Don't worry, I wouldn't let anyone hurt you.' He's a good guy to have in your corner." It isn't just fast service that makes Quinlan popular. Polish Hill resident Angela Okins says, "All my stories about Timmy are, like, you go up to the bar and say, ‘I need to get my car inspected.' And Tim says, ‘This is where you're going.'" Lots of people have stories of Quinlan offering help. One regular mentions that Quinlan gave her driving lessons ("We didn't have parking cones," she says, "so we used a sweatshirt and my can of coconut water"). Another recalls the time Quinlan gave him the bar's old ping-pong table, and helped move it. Quinlan is as welcoming as he is no-nonsense — which is exactly what people are looking for in a bar like Gooski's. As Hanzes puts it, "I like a nice cocktail as much as anyone, but sometimes you just want a drink. And you want it quick. That's what Tim is good at."